If you were on the NAB show floor this week in Las Vegas, you saw a plethora of direct view LED, up close. If you were not, you may be asking– what does NAB, or LED, have to do with my AV business? The answer is, a lot. NAB just wrapped. But past is prologue, because NAB was a glimpse into what’s coming for us all at InfoComm 2017 in Orlando in June. One of the hottest topics in the display industry today is direct view LED displays. LED’s strength's are pretty clear: much higher brightness, higher contrast ratio, no off-axis fall-off, and more. Of course cost has historically been an issue, and so has “resolution”. However, direct view LED with finer pixel pitch is: A) now available from a variety of manufacturers, and B) coming down in price. What are the advantages of this technology, for indoor digital signage? For outdoor digital signage? Are there other platform or performance details or idiosyncrasies that you need to be aware of? We’re all finding out. Showing direct view LED at NAB this week, were Samsung (showed its HDR LED), Planar (now merged with Leyard) with Planar/Leyard Direct Light LED Video Wall System, a family of seamless, ultra-fine pitch direct view LED video walls. 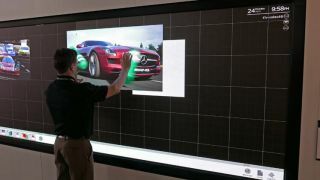 And notably, Leyard showed for the first time its new touch, interactive direct view LED. Sony had a formidable presence at NAB but concentrated on broadcast products. And there was also high res direct view LED from Barco, Christie, and Silicon Core. While in Las Vegas, NAB Show attendees could see Christie technology in action at the Westgate Resort and Casino Sportsbook where a 220 x 20 foot, curved Christie Velvet LED display keeps fans up to date– as well as at the Christie booth. What to look for at InfoComm? Ask direct view LED providers about the (changing) price differential between, say, a 2X3 video wall made up of a LCD panels vs. an equivalent size direct view LED video wall. It depends on what pixel pitch LED you are talking about– but drill down on the price differential and you’ll be surprised at how some pixel pitches of LED are now competitive to build a video wall. And also keep an eye out at InfoComm, for mounting solutions for direct view LED. LED has different, and more delicate mounting requirements than does a video wall made up of LCD panels. Interestingly, I got a primer on this topic from the guys at Premier Mounts, who had a booth at NAB this week, for the express purpose, according to Premier Mounts’ president Rich Pierro, to “support the LED explosion” in the market. And Premier Mounts’ Shaun O’Brien, Director of Solutions Group, gave me an update on LED’s unique mounting issues that AV integrators need to be aware of. O’Brien sees– from their “Switzerland” perspective– i.e. they provide mounting solutions for all the LED manufacturers– a large increase in the use of direct view LED for all applications, even in the boardroom and other applications in the corporate AV market that were long the domain of the video projector or LCD panel. So, yes, a lot of roads lead directly to direct view LED. InfoComm 2017 will be a blast– bring your sunglasses, this stuff is bright (a lot of nits) and is spawning fast.